For over 40 years Columbia Chemical has led the way in developing superior chemistry solutions for use in the surface finishing industry as well as innovative management strategies. Becoming an employee-owned company beginning in 2005, this commitment to excellence and innovation is driven by all employees and has become part of the culture. Made in Medina County had the opportunity to sit down with Brett Larick, President of Columbia Chemical to talk about the past, present, and future of the company. To say you are a chemical company is a very broad description. What exactly does Columbia Chemical do? B. Larick: We make the chemicals used in finishing metals and plastics that can be used on anything from your car to your headphones. In each case the raw product needs to be coated for aesthetics and corrosion protection. We work with companies all over the world to provide these chemicals and they rely on our innovations to keep making their products better. About 45% of the work we do is in the automotive industry and 40% of our business is outside the US. We work in joint ventures in China and Mexico and do business in 32 countries. 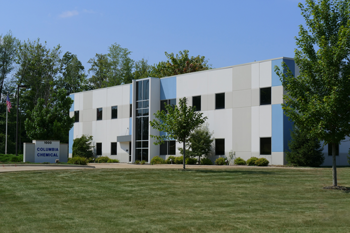 From our Brunswick headquarters, we handle research and development, manufacturing, warehousing, technical support and house our administrative offices. We were founded in Cleveland in 1975 by Bill Rosenberg Sr., a skilled chemist and researcher, and Herb Geduld, an accomplished sales and marketing professional. Together, their innovative spirit drove the company to become known for advancements in surface finishing technology. Working alongside his father (and eventually purchasing the company), Bill Rosenberg Jr. applied his talents and vision to help propel the company from its roots as a small family business to a world leader in the plating industry. What types of innovations do you mean? B. Larick: Columbia Chemical has always had a reputation of being a leader in the development of new technology for our industry. 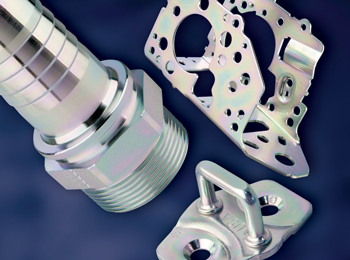 For instance, we were the first to meet the industry demand for a cyanide-free zinc plating product, which continues to be one of our top-selling product lines today. We also led the market in the development of a trivalent chrome passivate, a safer alternative to hexavalent chromium based products, made famous in the movie Erin Brockovich. As the European end-of-life vehicle (ELV) directive came down to move away from the use of hexavalent passivates to the safer trivalent, our leading product allowed us to strengthen our position in both the automotive and global markets. It sounds like your culture is very driven by innovation and looking forward. How did that come about? B. Larick: We’ve always been focused on innovation due to our founders. As the company grew, we became a 100% ESOP or employee-owned company in 2011. It took some time, but that really caused our culture to be very ownership-driven. When every employee has an ownership stake, they can easily connect what they are doing to the value we provide our customers and the overall value of the company. They identify weak links in the process, suppliers, or employees and they are resolved quickly. We are all accountable to each other. Our customers are always dealing with an owner and that makes a big difference in our service. It also means we are all very in tune with what our customers need and want and we strive to stay on top of industry trends and regulations. We have been a market leader in the trivalent passivate movement and the European ELV directive with our technologies and continue to focus on “green” products. It is important to us to minimize the impact of our products on the environment. That culture sounds ideal! What is the biggest challenge of being an ESOP? B. Larick: An employee-owned company is very different than the typical company structure. With everyone being an owner, we are completely transparent with our financials and information. We have just under 50 employees and we must keep everyone in the loop when we need to make major changes or decisions. It can be a challenge to communicate with that many people so we regularly meet with our employees and work hard to make sure everyone feels confident in what we are doing. Does that make it harder to spend money? B. Larick: Actually, we just made a major investment in our research and development capabilities which significantly enhanced the level of analysis and reporting we can provide to our customers and to automotive manufacturers. We followed that with a realignment and investment in our team of technical and sales account managers, allowing us to continue to deliver the technical support and service excellence we are known for in the market. If we are going to maintain our focus on innovation, these are clearly the areas where we will get the best return and our team knows it. It makes it easier to make such investments when we all share the same end goal. Why do you enjoy working at Columbia Chemical? It’s an atmosphere of growth, innovation and teamwork, which is refreshing. The nature of our work means it’s something different every single day. We may be working on a new formula for one customer, and then problem-solving something for another. Every employee contributes to our success and we make each other, and our company, better together. Last month, a few members of our executive team spent the day working side-by-side on the production floor with one of our managers and his team. 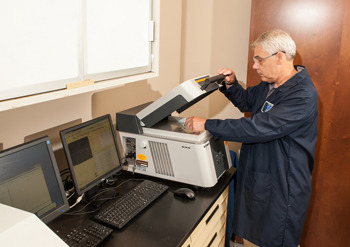 We identified a few processes we can improve and change as well as recognized the need to invest in some new equipment to make certain tasks more efficient and less physically demanding. As a result, we have already significantly increased production in one line. Being able to work together to make those differences and build a stronger company makes each day worthwhile.